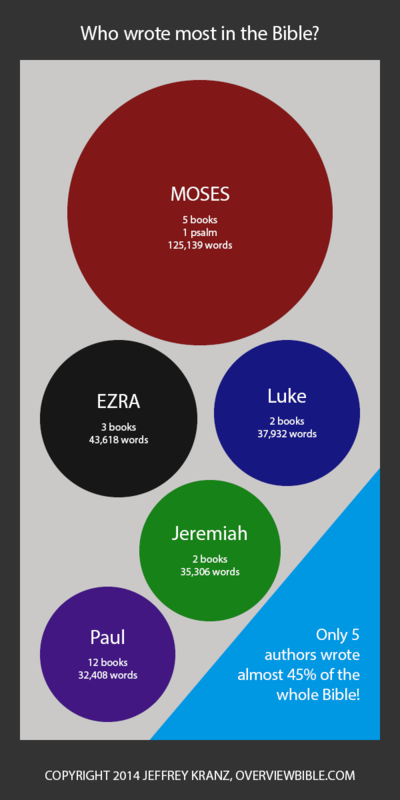 Infographic: Who wrote most (and least) in the Bible? Of all the authors in the Bible, who’s responsible for contributing the most content? Some of your favorite characters (like Moses and Paul) top the chart, but a few characters you may not know so well also made some sizable contributions. This infographic breaks down who wrote most in the books of the Bible. And in case you’re wondering who some of these authors are, you can check out their profiles here. Which biblical author wrote most? Here’s a breakdown of the five human authors with the biggest contributions to the Bible. And just so you know, I’m pulling these word counts from the original languages, not our English Bibles. I used The Lexham Hebrew Bible for the Old Testament authors (though I had to break out the NASB interlinear for the Aramaic in Ezra) and the NA27 (Greek New Testament). Obviously, I couldn’t have done this without Logos Bible Software. <a href="https://overviewbible.com/author-wrote-most-bible/"><img src="https://overviewbible.com/wp-content/uploads/2014/11/bible-author-wrote-most.png" alt="Authors of the Bible: who wrote most?" So now we know the five more prolific authors of the Bible, but just how do their works line up with the rest of the Bible, word-count wise? This guy is credited with 125,139 words in the Bible—specifically the books of Genesis, Exodus, Leviticus, Numbers, Deuteronomy, and Psalm 90. Granted, it’s probably a little less than that (since he wouldn’t have recorded his own death … right? ), but he’s the main guy who wrote down the Law God gave Israel. He’s also the one who gets credit for compiling the history of Israel from creation to Joseph in the book of Genesis. So, 125,139 words. The Bible’s only about 611,000 words long*, which means Moses wrote a little more than 20% of the Bible. That’s incredible. In word count, Moses stands a good head and shoulders above all the other writers. And if you consider all five books of the Pentateuch to be one five-fold book, that means Moses wrote the longest book of the Bible. Of course, it makes sense that Moses composed so much. The last bit of Deuteronomy says Moses has a special relationship with God: the Lord spoke to Moses face-to-face, not just in dreams and visions (Dt 34:10). With that much contact with God, Moses better have a lot to say! * “Only about 611,000 words long”? I must be losing touch with reality to be writing sentences like this. Ezra is a scribe who has traditionally been called the author of 1 & 2 Chronicles and the book that’s named for him. He’s knowledgeable of the Law of Moses and committed to teaching it to the rest of the people (Ezr 7:10). And he sure does! Ezra’s word count comes to 43,618 words in Hebrew and Aramaic: about 7% of the Bible. Which may not sound too impressive next to Moses’ word count, but then, we don’t have much direct God-speaking-directly-to-Ezra footage in the Bible. You’ve probably heard someone say that Paul wrote half of your New Testament. With condolences to Paul’s fan club: it turns out Luke wrote a lot more. Luke’s responsible for 37,932 Greek words, which means he wrote more than 6% of the Bible. Luke’s a friend of Paul’s who interviews eyewitnesses of Jesus in order to get all the facts down. Afterward, he records the history of the early church’s expansion (and this time, he is one of the eyewitnesses). Luke is a physician (Col 4:14) whose meticulous interviewing process brings forth the Gospel of Luke (which is the longest book in the New Testament) and the book of Acts. The “weeping prophet” is actually responsible for the largest book of your Bible: Jeremiah. He’s the one sounding the alarm of the impending invasion by Nebuchadnezzar, the king of Babylon, but the people of Judah will not listen. In fact, they try to off the prophet time after time (which factors into the weeping). But Jeremiah doesn’t just write the longest book of the Bible. He’s also credited with writing the book of Lamentations, a clever collection of acrostics that mourn the fall of Jerusalem. These two books bring his tally to 35,306 words, which is just shy of 6% of the Bible. Here he is! He may not have written half the New Testament, but he is responsible for more individual documents in your Bible than anyone else. Paul wrote 13 letters to the early churches and church leaders, and of all the New Testament writers, he’s the one who gives us the most insight as far as how the church should work, and the doctrinal reasons why. Paul rounds out the top five with a word count of 32,408—a few ticks over 5% of the Bible. OK, so who wrote the least in the Bible? Just in case you’re curious, here’s the list of chaps who made the smallest contributions to the Bible. I’ll list these down from greatest contribution to the smallest. And yes, this is still in the original languages, and from the same Hebrew, Aramaic, and Greek resources. With only 461 words in his single-chapter letter, Jude is the author with the fifth-smallest contribution to the Bible. That’s only about 0.08% of the Bible. And the word counts just get smaller from here. He wrote the least popular book of the Bible and the shortest book of the Old Testament: just 440 words, which is 0.07% of the Word. This guy wrote Proverbs 30. He was a wise man, but compared to God, he says he feels like a real dummy (Pr 30:2). He gets 419 words in the Bible. The mysterious king who wrote Proverbs 31—which is really a tribute to Lemuel’s mother. He has 350 words in the Bible. This guy was a pretty famous wise man (1 Ki 5:11), and he weighs in lightest of all the Bible’s authors. He has 233 words to his name, but even that is a pretty generous figure. Heman coauthored Psalm 88 with the sons of Korah (who wrote several more of the Psalms). I would like to put the graphic in our church bulletin. Do I have your permission? Question, I am doing a project on the Christian Religion for school, and I was wondering how many books John wrote, did you just forget about him? Or did he really not right that many? As far as sheer number of books, John wrote a lot (his Gospel, his 3 epistles, and Revelation). But his epistles weren’t very long. This is probably done by word or page count, not number of books. This is done by word count. If you consider John the Elder (Gospel, 3 epistles) and John the Revelator (Revelation) to be one and the same (and I tend to), then John is the seventh most prolific author—right after Ezekiel and right before Isaiah. Right, that’s what I was trying to explain, thanks. this is old, but shouldn’t you include king david in the top…lots of psalms were his, or would that still put in further down the list?